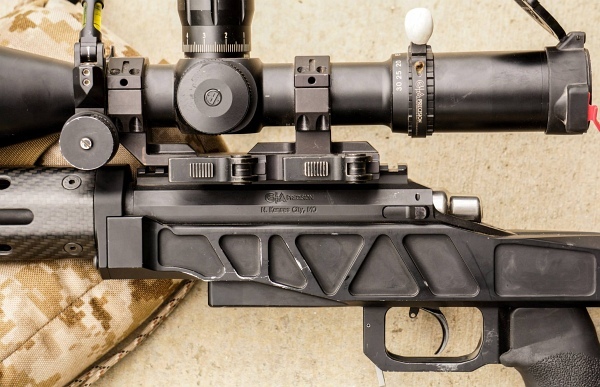 Krieger Barrels has some great news for Savage rifle owners. This fine cut-rifled barrel-maker, a long-term sponsor of AccurateShooter.com, now offers Pre-Fit (pre-chambered) rifle barrels for Savage actions. With a Krieger pre-chambered barrel, you save time and money — you don’t have to pay a gunsmith hundreds to cut the chamber, and wait weeks (or sometimes months). With the proper GO/NO-GO gauges and barrel nut wrench, most rifle-owners can install their own pre-fit barrel. Choose from multiple calibers/chamberings and custom contours for large- and small-shank Savage actions. Call Krieger Barrels at (262) 628-8558 to start your order. 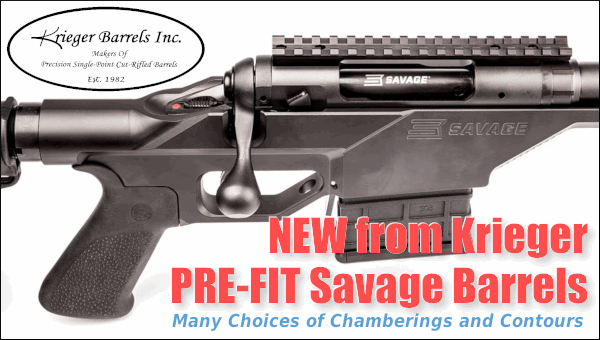 Pre-Fit Savage barrels start at $515.00 + S&H. Call today to discuss your needs and get a barrel order going! For more information visit KriegerBarrels.com or call Krieger at (262) 628-8558. 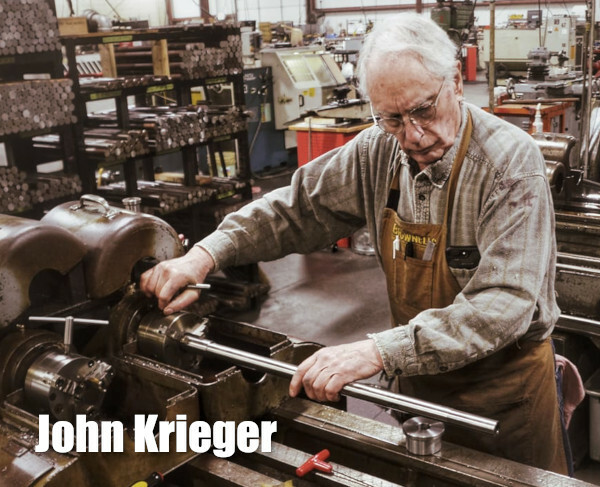 Company founder John Krieger hard at work at the Krieger Barrels production facility. Share the post "Krieger Barrels Now Offers Pre-Fit Savage Barrels"
Shooting USA will broadcast a great episode today, February 27, 2019. There are three segments worth watching. First the TV show spotlights the popular GAP Grind, a Pro-Am PRS event at the K&M Precision complex in Tennessee. 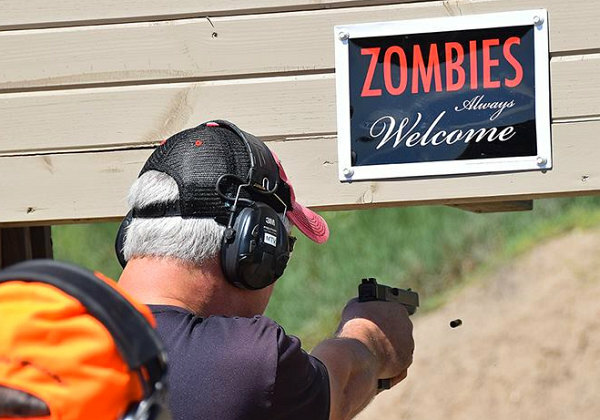 Then this episode covers Hornady’s Zombies in the Heartland multi-gun match. This popular event, hosted in Nebraska every year, is one of the biggest three-gun shoots in the nation. Finally there is a historical feature on the 7-barrel Nock Volley gun from the late 1700s. SHOW TIMES: This Shooting USA Episode airs February 27, 2019 (Wednesday) at 9:00 PM Eastern and Pacific; 8:00 PM Central. You’ll find the latest and greatest PRS hardware at the GAP grind. Notable this year was the fact that many top competitors “stepped down” from the 6.5/6mm Creedmoor to the smaller, more efficient 6mm Dasher (and other 6BR Improved) cartridges. The Dasher offers excellent accuracy with less recoil than the 6.5 Creedmoor. Also, many top shooters are now running Kahles optics. Photo by Shelley Giddings. 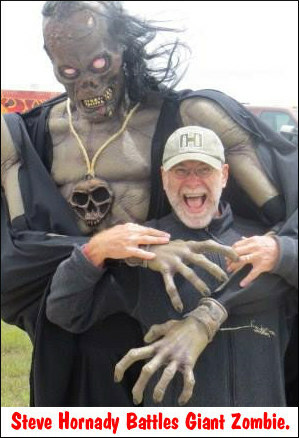 Every year Hornady hosts the very popular Zombies in the Heartland event. 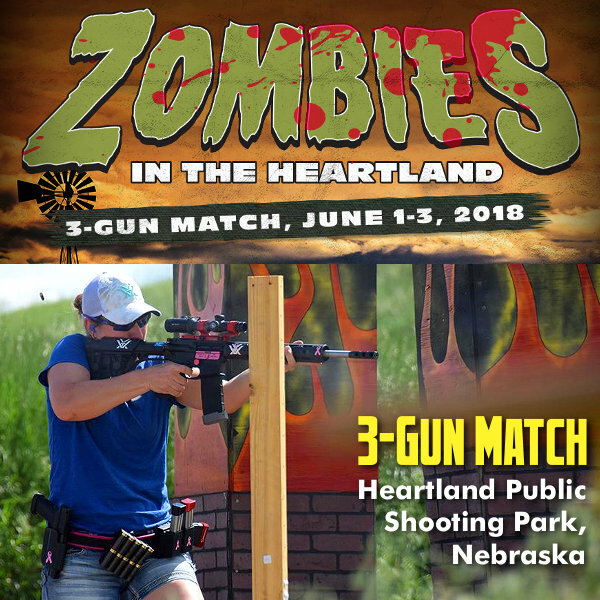 This “Pandemic” 3-Gun fun match, one of the biggest three-gun shoots in the nation, was hosted by Hornady this past summer, June 1-3, 2018 at the Heartland Public Shooting Park in Grand Island, Nebraska. The Pandemic featured a rich prize table worth over $150,000. Prizes include pistols, rifles, shotguns, scopes, AR uppers, gun parts, and gear of all kinds. There were ten multi-gun stages this past year. Rifles, pistols and shotguns are used on most stages. There were also fun side-matches. We highly recommend you watch the video below to see highlights from a past Pandemic. 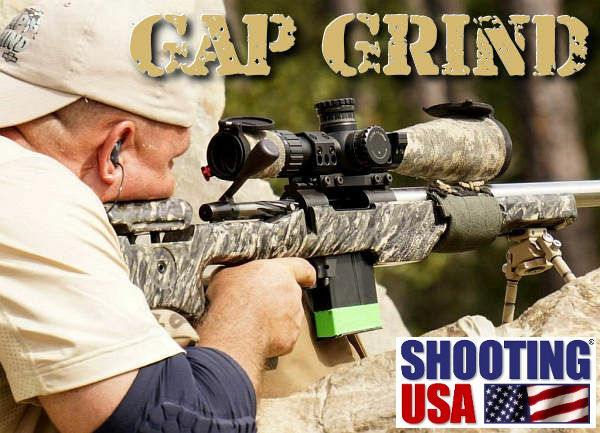 Share the post "Shooting USA TV — GAP Grind PRS and Zombies in the Heartland"
Tired of spending $15-$25 for a can of spray lube that doesn’t last that long? For about the same price as a single 10 oz. can you can make your own effective spray lube that should last for multiple seasons and lube thousands of cases quickly and easily. 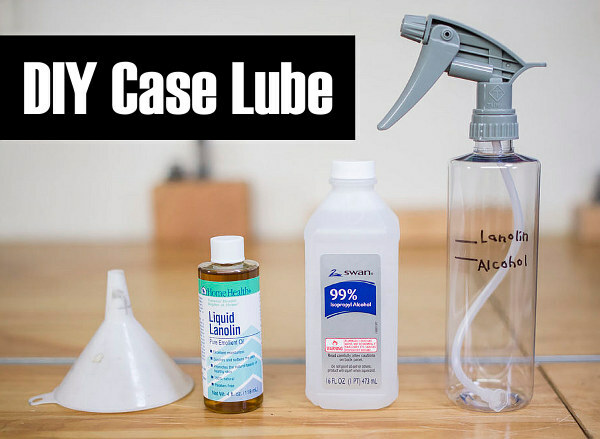 In the YouTube video embedded below, our friend Gavin Gear of UltimateReloader.com shows how to make your own case lube using simple, inexpensive ingredients. As recommended by the 6.5 Guys, this Liquid Lanolin + Isopropyl Alchohol mix works well and is very cost-effective. You can make a pint of this home-brew Lanolin case lube that will lube thousands of cases — many more than a typical commercial aerosol spray can (that’s mostly compressed air). Gavin describes the exact mixing process on his Ultimate Reloader website. Gavin says this lube mix is a good complement to the Hornady One-Shot (pistol) and Dillon DCL (rifle) lubes he has used for pistol and rifle reloading sessions. CLICK HERE to read more. Share the post "Cheap Tricks — Make Your Own Case Lube with Lanolin"